Home › Medianism Home › MELI FAQ › M5. Why doesn’t anyone care about existing measures of median income? The first reason why few people use median income is the path dependence of history; the government has been collecting official data about median income for a couple decades by now, and Median income is a much younger tradition. Society has already invested more than 80-years in making GDP measurements, plus decades more theoretical work on measuring “the national dividend.” By now, everyone is in the habit of using GDP and almost nobody uses median income, so few resources go into measuring median income. That makes median income is less useful because it is measured poorly. That causes a vicious cycle in which it is not used because it is measured poorly and it is measured poorly because there is no point in investing more resources when nobody uses it. Secondly, Kuznets began measuring GDP about 80 years ago, but even before that, economists spent decades developing theoretical machinery to support it. For example, at the turn of the 20th century, Vilfredo Pareto was already arguing that the best way to help everyone in an economy, including the poor, was to increase mean income because the benefits would trickle down due to what Pareto saw as the inevitability of inequality which is today called the Pareto distribution. Pareto way laying the foundations of the mutilitarianism. The mutilitarian revolution is sometimes called the Paretian revival in his honor. 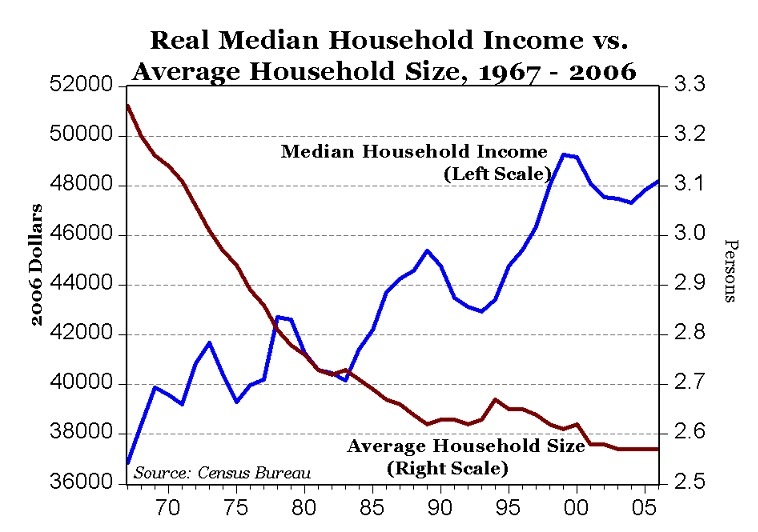 Thirdly, median income, like GDP or inflation, is not completely straightforward to measure. The most common form of median income data is median household income and its main problem is that a household is not a fundamental unit of welfare; a person is. If one household earns $100k and a neighboring household earns only $50k, that says almost nothing about the welfare of the people in the two households because we don’t know how many people are in each household. If there are five people in the first household and only one person in the second, that would give a very different picture of relative welfare than if the populations were reversed. Perry complains that median household income is a misleading statistic because the mean household size is declining. It is a weird failure of imagination that (almost) nobody has ever bothered to adjust median household income for household size because it is fairly easy to do and even a crude adjustment for household size is better than no adjustment. Probably the reason that the adjustment isn’t made is that there are various ways that we could make the adjustment and it isn’t clear what the absolute best way is. The simplest way is to divide by the number of people in the household, but a household of 2 adults and five small children is quite different from a household of seven adults. (So different, in fact, that it is hard to even imagine a household of seven adults!) The household with five small children will divide resources quite differently than the household with seven adults. The USDA estimates that each child would get about a third as much of the household income as an adult would get. The simple household-size adjustment would simply divide household income by the number of people, but common sense (and the USDA) tells us that this is not the best way. Additionally, there are economies of scale in household size. A household of three people does not want a house that is three times larger than a household with only one person. It would be better to have a more complex formula to also adjust for different ages in the household, but that adds complexity which may not be worth the trouble. Excessive complexity makes a measure less useful. There is some arbitrariness to any formula for how income should be adjusted for household size and composition, so adding this bit of complexity invites some controversy. As David Betson says, “‘equivalence scales are inherently arbitrary’ and as such are in reality subjective judgments masquerading as science”, such that “the setting of scales is more a matter of policy judgment than the application of scientific theory.” But there are already standard procedures for adjusting for household size that the Census Bureau uses in estimating poverty levels and for estimating inequality. Oddly, the Census Bureau does not do the same kind of equivalence adjustment for measuring for measuring median income. Other statistical agencies like the OECD also do equivalence adjustments for household size, but neglect median income. MELI could help make household size adjustment a bit easier. (HYPERLINK coming soon), but economists have not considered it because of their mutilitarian ontology which restricts their imaginations.